A U.S. Army team transfers the remains of Staff Sgt. Dustin Wright, 29, of Lyons, Ga., at Dover Air Force Base, Del., on Oct. 5, 2017. 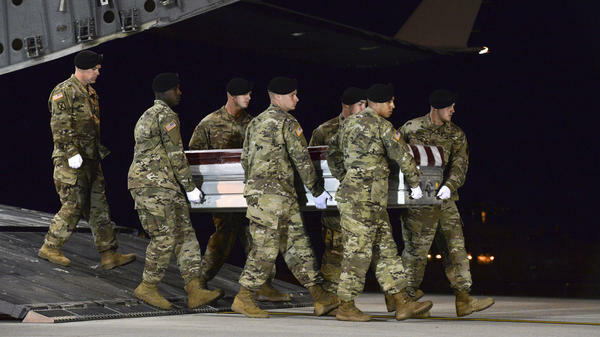 Wright was one of four U.S. troops killed in an ambush in Niger. The mission began on Oct. 3, when 12 Americans, led by Green Berets, joined with a larger force of Nigerien troops on a routine patrol in the southwest part of the country, near the border with Mali. The Americans have been in Niger since 2013 to train, advise and assist the Nigerien military in its battle with extremists linked to the Islamic State. The Americans are not supposed to take part in combat unless they come under fire. On the mission, the Americans and the Nigerien forces were meeting with village leaders. The troops spent the night, and instead of returning to their base the next day, they were given a new mission. They were called to look for intelligence in a place where a militant leader had apparently fled. According to the official, who has seen the report, a lower-level officer signed off on this new mission, and higher-level officers were not kept abreast of it or were not aware of the change in plans. The U.S. team was not anticipating any contact with the militants, and didn't have proper planning, training or heavy firepower. The four Americans killed were Staff Sgt. Bryan Black, Staff Sgt. Dustin Wright, Staff Sgt. Jeremiah Johnson and Sgt. La David Johnson. Two more Americans were wounded, and five Nigerien soldiers were killed. The report says the soldiers fought bravely. There was helmet-camera video that showed some of the soldiers pulling wounded comrades to safety behind an SUV. The report does not cast blame or call for punishment. But it does say there were failures at multiple levels, and calls for them to be addressed by the Army and the Special Operations Command. President Barack Obama sent the U.S. troops to Niger five years ago, and around 800 are believed to be in the country. The Americans are building a base for drones, but do not have a large airfield for manned aircraft that could mount a rescue mission. The New York Times reported that on Dec. 6, two months after the October ambush, another group of Green Berets and Nigerien forces killed 11 militants in a shootout. The U.S. military did not announce the fighting at the time. But the Times reported it on March 14, calling it one of 10 previously undisclosed clashes in West Africa since 2015.